Vampires are cold, pale creatures that feed on blood. 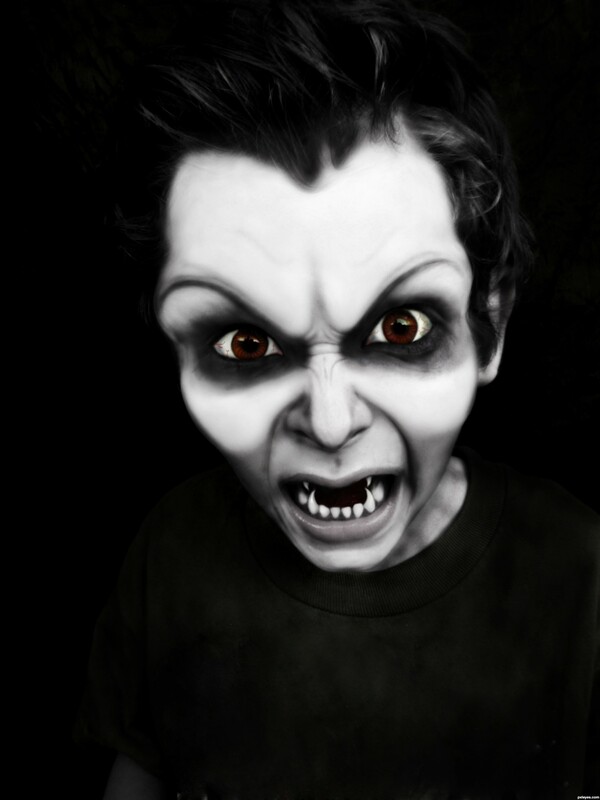 Your goal in this contest is to transform a person into a vampire using Photoshop. 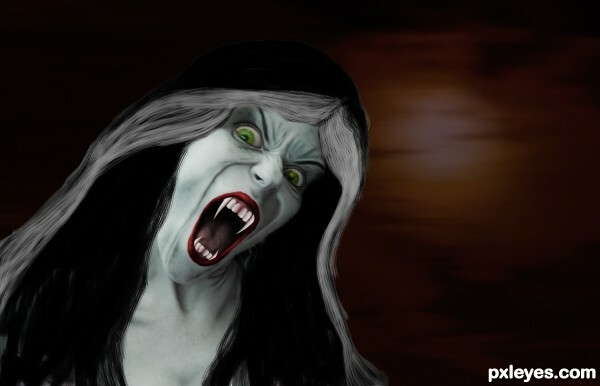 You might make his/her face become more pale, change the eye color, the teeth size, etc. As long as the final product does not look like the normal human-being you'll be ok. 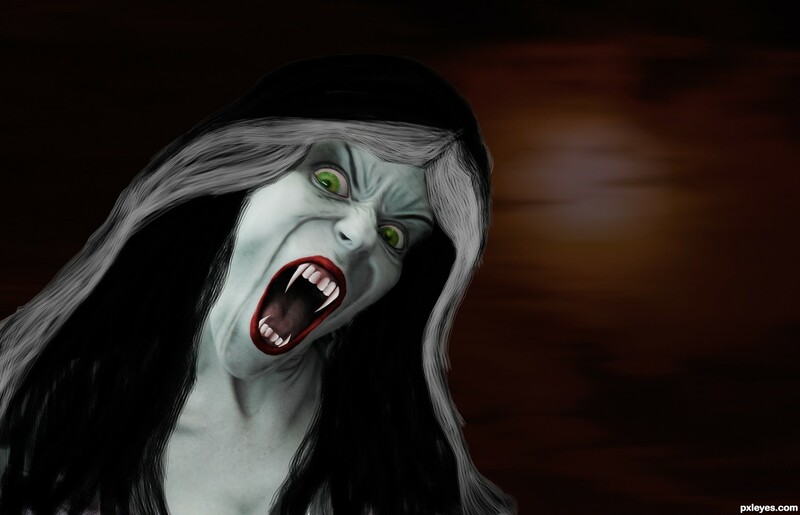 If the word vampire has a personal meaning to you, don't forget to mention it in your description box and keep in mind that vampires are not only dark , horrible creatures, they can be good too. One last restriction is that only one person is allowed in your entry and you can't have the vampire drinking blood from any body. Good luck! 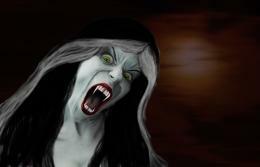 Vampires favorite type of moon, this was fun!!! You got to make it very spooky! Great work! Ummm, that's one super scary vampire. I was just starting to like them with all the Twilight Saga, but now I'm a little scared. Oh Heavens, where is my garlic = ) Great work. very cool image captured that contest! Good job !! Is the best entry. Great job on the face. If you had put the moon on the other side, it would match the lighting. Wow, such great comments, thankyou all!! 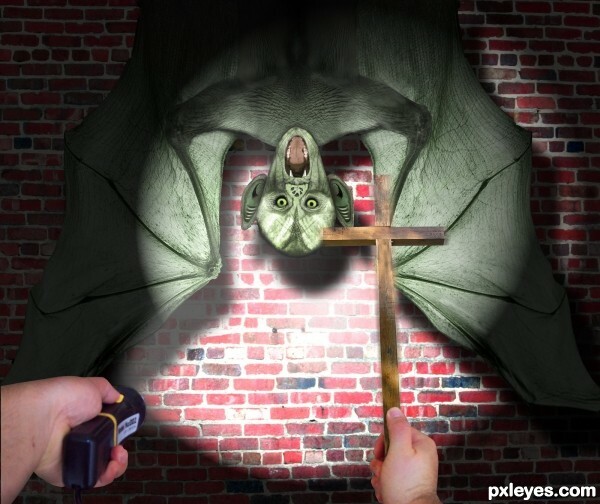 This was what I thought of when I heard vampire, great stock photo certainly helped my vision. @CMYK46.....Thankyou for your tip, but in order to balance this composition, the moon had to go where I put it, lets just pretend there is another light source like a lamp post out of sight on the other side giving the lighting on the face....LOL. Your critiques are always welcome. Brilliant work, brilliant SBS, very very good! @DanLundberg, I have changed my background a bit by adding a gradient overlay at Multiply blending mode and adding a bit of a motion blur to look more fitting as you thought it needed. What do you think now?? I really appreciate your suggestions along with your nice comments. Happy to see this one is NOT a Twilight resemblance. This seems to take on more of a comic book appeal, like out of a Vampire Hunter comic. It's very well detailed and excellent imagination. Well done and good luck! Congratulations, and might i say...THANK YOU SOOOOO MUCH for using my stock. Thankyou everyone....I never thought anything would come of this, just had fun creating it. inspired by anne rice's child vampire "claudia" in "Interview with a Vampire" where the vampire Lestat had turned a young girl into a vampire. This is my rendition, using my own stock photo of a young boy. Spooky! He seems dangerous in his youth. Nice job! Just one suggestion: put some shading on the eyeballs. Very impressive work. Good handling of the liquify tool. Personally I would have left a bit more of the original skin colour show through, especially with the very strong eye colour, but it's awesome work. I like this alot!!.. good work. Very cool source image to start with. changed the shadowing in the eyeballs...also added some bloodshot veins. Sorry, but i like the deep contrast of the desaturated skin and the saturated eyes, so i'm not changing that. But thank you for the suggestion, and the amazing compliment, widiar. This was a fun contest. and yes, skeletor, i've got some great reserves of stock images for just weirdness. Thank you. And Erikuri, Nator, Heinrich and neeraj55 ...Thank You so much for the compliements! erikuri....he is a bit evil at times. Very scary - well done! Now this is wicked-cool!! Reminds me of "Lost Boys" vampire boy. Your details and additional features of making an immortal creature of the night are exceptional. Well done and GL! Can you see I've seen a lot of vampire movies??? Thank you all so much for such wonderful comments on this. I had a lot of fun...and my crazy model is really happy with the nice things you've all said. He's quite proud of his evil self. So glad to see this is one of the deserving entries, placing so high. Congrats! 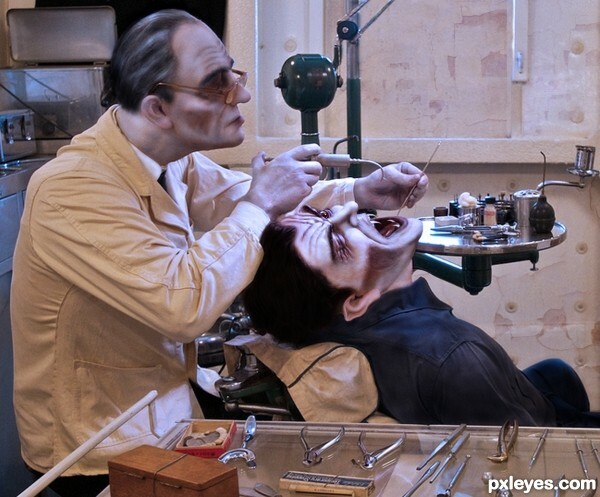 even the Count has to see the dentist sometime, and who better to trust! *thank you to Neveryph Stock at deviant art for the decay brushes. Love this! (Wish you had used the highest res image, though). wow cmyk. Love even? thank you!!!! and yeah, i must have gotten the wrong download when i first aquired the source. But no matter, lesson learned. This is a great entry only problem I can see with it is it is not following the rules of the contest . . I might be wrong but I don't think so .. " One last restriction is that only one person is allowed in your entry and you can't have the vampire drinking blood from any body. " replace the Dentist with a animal or something lol. dog or a bear that would get ya around that rule. He's not drinking blood from anyone. i suppose i could cut the focus down to just one person being the focus of the picture... but i didn't get that i couldn't have a vampire and an undead undertaker/dentist. Changing that guy into a bear or an animal takes out the whole POINT of going to a dentist. he wouldn't be at the dentists, would he? he'd be at the zoo or something. and a werewolf is technically still "human" in some aspect. so even that gets tossed out. Suppose i ask a mod. afterall, they are the ones to make that decision. if the dentist is a vampire as well, then he's not "human" right? look at the facial colorization. intentionally pale, which i did alot of work to get to that tone. and in that case only one "person" is in the shot, and 2 vampires. Ya that might be ok it's up to MOD. I don't redflag images so I would check with a MOD. red flag sent to moderator. Thank you for bringing it to my attention though IronCow. i do appreciate it. perhaps tonight while i'm bored out of my mind i'll figure out how to turn the other guy into a werewolf. but really, i'm very happy with how the image turned out so i don't want to screw it up. if it can't stay here, i'll just put it up elsewhere. Save a copy psd This is cool Author I would save it too. Ya like I said is a great image. I feel bad bringing it up but at least ya have time to change it. I hate when some one flags it after the deadline and then your screwed. If all else fails and you have to stick to the silly "only one person" restriction, just crop the pic so all you can see are the hands, which shouldn't be considered a "person". Very clever and a great image and work, but I would agree there could well be an issue with the one person contest rules. well i'm waiting on a mod's answer for this...but i'm hoping for the best! great! and I think the second person is a must! Excuse me Dan...but I didn't realize I couldn't have two vampires. Or a person and a vampire, as long as that person wasn't being eaten. And to me...a vampire is no longer a person but a part of a different breed all together...just like a person turned werewolf is no longer person but lycan. I acknowledge your opinion as what it is but must you be so rude when voicing it? Read the comments...I already flagged my own entry for the mods to consider. Why waste your time insulting my intelligence by assuming I ignored rules when I clearly stated that I contacted a moderator. And just because I'm persistant, I've flagged this a second time. Its nothing about not wanting to disobey the rules. I just read it differently and if its not welcome here it will be in my other portfolio. I didn't state I didn't like the contest goal and I am very aware of my ability to suggest others. I think my creativity DID overcome an obstacle, EH? To be honest once again, I think the rules were interpreted quite dubiously. But what comes to the image, it's superb as mentioned several time. widiar... thank you for mentioning SUPERB following your honest opinion of my dubious interpretation of the rules. :lol: obviously i'm not the only person (thats right, person, not undead, not vampire, not werewolf, not ghost or ghoul...but person) that dubiously interpreted the rules in the same manner as i did. The mod has spoken. Good luck Author Great chop indeed. And I'm not surprised to see it's you author. You are truly creative in the field of PS and always getting better. I would seriously be shocked if this did not at least place. This is great work, author, and good for you for standing up to the naysayers. Every art piece is different, as are the interpretations of the contest. I think you did a fabulous job, regardless of what others think. ...and your third place, Jade! And congrats again, for this enter definitely deserved a high placement. Both pieces placed but I thought this one was a winner in my eyes. Pretty good. Maybe make him more pale & do something with the eyes. 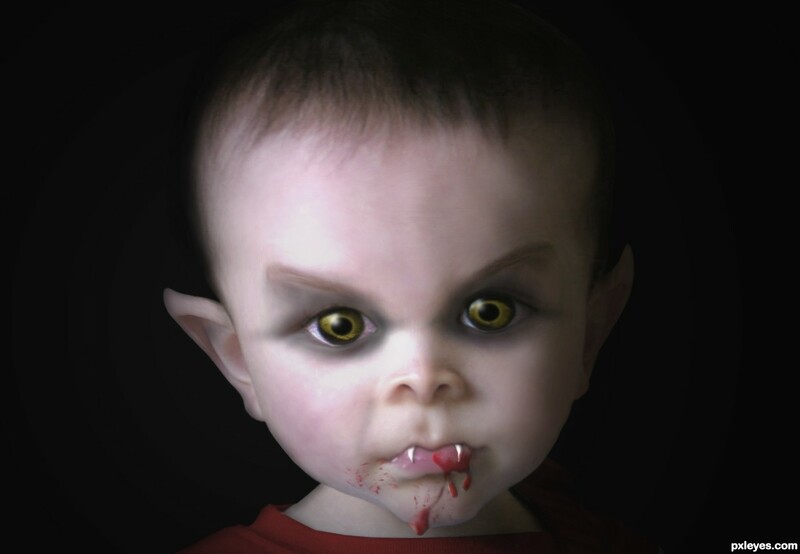 Yep, he's too much rosy for a vampire, even a baby one! Updated, hope it's better now... Thanks for the feedback erikuri and cmky46! ahahhaahahahhahhhahahah this is one of the best! Niiiiiiiiice! 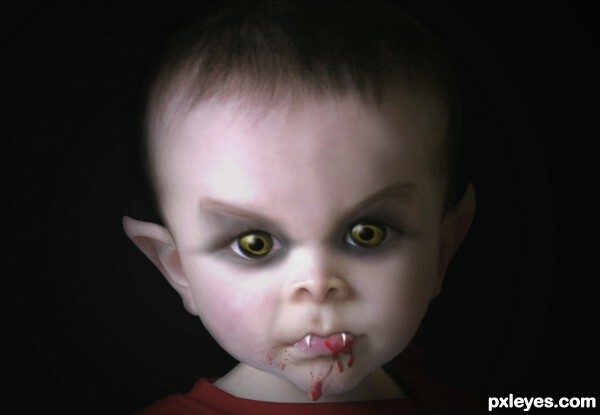 Freaky eyes on the little vamp. The pictures of the arms/hands are my own stock. I think you meant "scared". Good entry...finally something creative! SBS is missing a few things, though. Very neat, but it's more bat than vampire, IMO. Classical vampires can turn into bats, and vice versa...I have no problem with the batlike image.